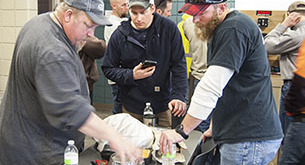 The Meter School is an annual educational opportunity offering valuable technical training and hands-on work with electric metering equipment. To ensure an optimal educational experience, participants select their preferred class level—Basic/Intermediate or Advanced. A Pre-Conference is also held in conjunction with the School, which is an ideal refresher course on basic metering or introductory course for those with little metering experience. For maximum benefit, consider registering for both the Pre-Conference and Meter School. The Basic/Intermediate class is aimed at personnel with little experience with electric meters. Training will build on the Pre-Conference session, and will include more hands-on training. The Advanced class will use a combination of methods and tools, including: self-corrected meter exams, interactive classroom and hands-on training to present and reinforce the instruction. Q & A all week long! The flexibility of this class allows participants to progress at a pace that fits their motivation and abilities. Larry Chapman has worked in the metering business his entire career, and is highly respected. Larry has been an instructor at the MMUA Meter School for more than 10 years. Scott Murfield will also be on hand to partner with the instruction. Scott spent 30 years in the electric utility industry. Most recently, he was Regional Safety Coordinator for MMUA until his retirement. Scott is a certified Journeyman Lineman, Journeyman Electrician and Loss Control Professional. Additional instructors to be announced. Individuals registered in an apprenticeship program may be able to use the hours from this school toward a portion of the apprenticeship program completion! All fees increase $50 on January 18, 2019. Registration fee includes tuition, materials, Thursday lunch, refreshment breaks, and a certificate of attendance. Note: Wednesday lunch provided if registered for both the Pre-Conference and Meter School. MMUA will issue a refund (less $30 processing fee per person) provided MMUA is notified of the cancellation by 4:30 pm on January 28, 2019. No refunds after January 28. Contact Theresa Neddermeyer by email tneddermeyer@mmua.org or phone 763.551.1230. A printable version of the Meter School brochure is also available.